Pokémon Mystery Dungeon: Blue Rescue Team (ポケモン不思議のダンジョン 青の救助隊 Pokemon Fushigi no Danjon Ao no Kyūjotai?) and Pokémon Mystery Dungeon: Red Rescue Team (ポケモン不思議のダンジョン 赤の救助隊 Pokemon Fushigi no Danjon Aka no Kyūjotai?) are a matched pair of Pokémon games for the Nintendo DS and Game Boy Advance, respectively. These two games were developed by Chunsoft and were published by Nintendo. The two versions are mostly identical, with the Blue version taking advantage of the dual-screen features and increased graphical capabilities of the Nintendo DS. The game has six Pokémon exclusive to each version. 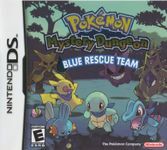 As of July 25, 2007, Pokémon Mystery Dungeon: Blue Rescue Team sold 3.08 million copies worldwide. The player starts out as a human who turned into a Pokémon, which can be one of sixteen Pokémon(Bulbasaur, Squirtle, Charmander, Cyndaquil, Totodile, Chikorita, Treecko, Torchic, Mudkip, Pikachu, Eevee, Machop, Cubone, Psyduck, Meowth, and Skitty) and is determined by a personality quiz taken at the beginning of the game. The player chooses a partner Pokémon which is one of ten Pokémon (which excludes the last six stated above and the Pokémon of the same type). The game is mission-based with many jobs, which can be found on the bulletin board, requested by mail, or initiated through story events, and include rescuing Pokémon, delivering items, or escorting clients. If the player successfully completes a job, they receive a reward, and Rescue Points, which increase a team's rank. These jobs take part in dungeons, of which the layout is randomized. The objective is to either finish a job, or go through all the floors to find the exit. In the dungeon, there are wild Pokémon that battle with the player's team. These battles are turn-based, and take place in the dungeon map. Pokémon fight using the four moves they know, by using a standard 'A button' attack, or throwing rocks and other items. While going through the dungeon, the player gets hungry, and has to eat food either found in the dungeon, or bought in advance. Source: Wikipedia, "Pokémon Mystery Dungeon: Blue Rescue Team and Red Rescue Team", available under the CC-BY-SA License.